Today is the last day of Debating Threats to Democracy program 2016-2017. 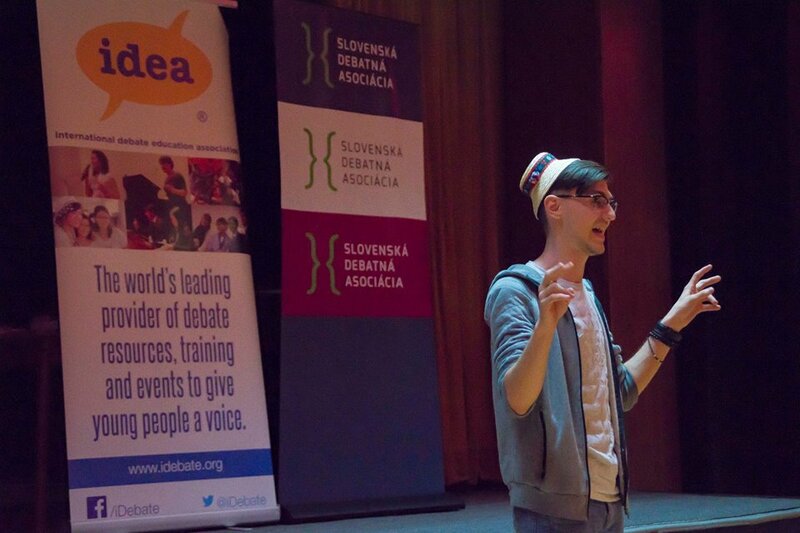 We are looking back on great international and national debate events in 15 European countries.One very impressive event was the recent international event in Bratislava hosted by IDEA NL member the Slovak Debate Assocoation. During this event international workshops and debates were hold for more than 150 participants from 15 EU countries that attended the final international event of the project Debating Threats to Democracy that took place in Bratislava, and was hosted by the Slovenská debatná asociácia (Slovak debate association) and IDEA NL. To celebrate the conclusion of the event, new knowledge and, most importantly, new international friendships, the event ended on a festive note with a cultural exchange, where participants shared memorabilia, symbols and food from their countries. The program was divided in two parts and first block of workshops was focused on a content of various threats to democracy that are pertinent to citizens from all around the Europe. Topics ranged from (im)migration, the difference between democracy and liberty, systems of government and elections, history and challenges of european integration, children's rights, nationalism, war and military interventions, and Brexit to terrorism, populism, global inequality, civil movements and advocacy. Part of the content workshops has been focused more on the media perspective of the issue – on the media commercialisation, its influence on the general perception of reality, stereotypes, civil movements and advocacy. Within a range of content sessions, trainees also had a chance to attend workshops conducted by three guest speakers; the first one was on disinformation and hybrid war in the EU, given by Katarina Klingova from GLOBSEC Policy Institute, in the second one Tomaš Grečko tackled conspiracies on the internet, and in the third one Zuzana Hanzelova from the Slovak state television talked about the role of media and journalists, and about the relationship and challenges between Roma minority, media and the government. Second block of workshops was focused on debate and trainees had an opportunity of learning not only about argumentation, refutation, asking questions, framing the debate and adjudication, but also about fake news, rhetorics, adaptation of language to a specific audience, and persuasive delivery. This event marks the conclusion of the first Debating Threats to Democracy project that was a collaboration between IDEA NL and national debate organizations from 15 countries (listed below) and backed by the program Europe for Citizens. Debatu Centras Lithuania and Slovenská debatná asociácia deserve a special mention as they hosted the two international debate exchanges; first one was in August 2016 in Vilnius and Druskininkai, and the second one just ended in March, 2017 in Bratislava. All national organizations spent almost 18 months preparing and realizing public debates, debate tournaments, public lectures, meetings with politicians and a variety of other national events, forementioned international events brought together more than 300 young people, a policy brief was written by participants and presented in the European Parliament, and by the end of the project more than 1500 young people from across Europe was actively involved in discussions, they shared ideas and critically approached current and actively participated.